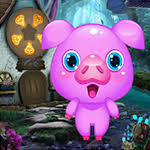 Games4King - G4K Cute Pig Rescue Escape is another point and click escape game developed by Games 4 King. There was a dark surrounding mystery in a beautiful giant village. There was a fortress in this mysterious surrounding area. The fort is very intimidating to see. There was cute pig in that place. One day, the cute pig was unexpectedly stuck in the fortress. It is your duty to rescue the cute pig. It will help you to find the hidden clues to save the cute pig. Detect all the spots and find all the clues to free the cute pig. The trick is to get all the clues that are a bit harder to find, but somehow it may be interesting. Good luck and have fun! Red/Green puzzle: don't try to unravel the interlocking lines on the symbol - use the word hint. A bit different...very enjoyable! Thank you, G4K!